It's National Poetry Month, y'all!!! I am doing the 30 Poems in 30 Days Challenge. However, I also want to reacquaint myself with my own collection of books. My challenge will include reading from a random book in my collection each day and possibly allowing my poem of the day to be inspired by that fresh read. I will post a photo of the poem I am reading, a photo of my raw poem, and I will type my best draft here. Last night, I read from a book of poems influenced by the tumultuous love of Frida and Diego. I have not looked at this book since I first read it when Lori Izykowski gave it to me as a gift. A poem that gave me pause was "Paint Me Flying." I like the way it is written, as it can be read together or as two separate poems. Instead of being inspired by the subject in the poem, I am working with the form to write a poem about transformation. I know a number of people with fluid gender identities, and this form seemed like a good one to explore that idea of transformation. Here are some shots of the original poem and my notes for the poem I wrote. Labels—what need have I for them? shattering definition, patient and lean. What need have I for mirrors? 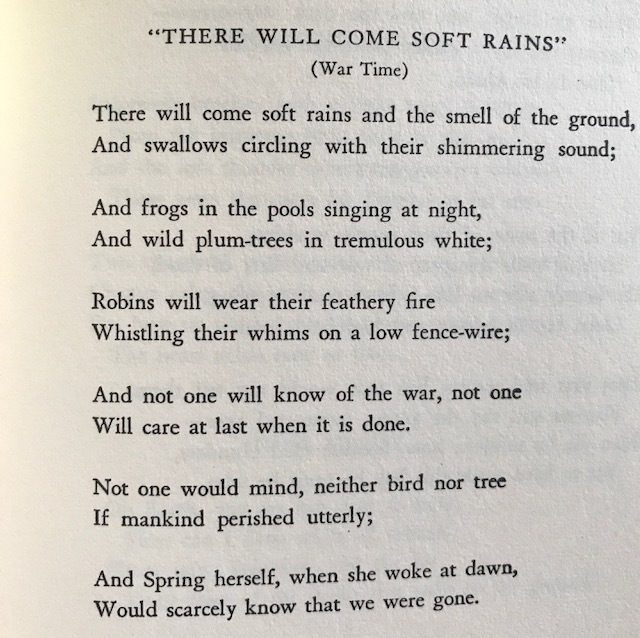 I chose an Ezra Pound anthology from my table last night and came across a poem called "Meditatio" that immediately had me thinking about another poem by Sara Teasdale called "There Will Come Soft Rains." I first read "Soft Rains" in the Ray Bradbury story with the same title. Bradbury is a favorite author of mine, in part because of his poetic style, but also because he was a lover of words and was self-taught through the public library system. He often used other literature to influence his own stories. So, back to the Pound/Teasdale connection. 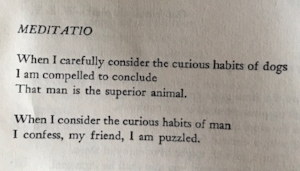 The two poems do not say the same thing, but they reflect a similar idea, that is the great folly of humanity: we are a part of nature, but we place ourselves as chosen or outside of nature, rather than embracing our natural selves. We debase our very nature when we see ourselves as above our fellow occupants of this planet. We are not a priority, and because we don't live in harmony, we face a multitude of problems. The dog, the tree, bird or season couldn't give a care about where we place ourselves. That's the beauty of nature. We are a part of it, whether we acknowledge that or not. And it doesn't acknowledge us at all. It just keeps doing its thing. Dog is dog and always will be dog. Bird is bird, whether humans make fire with sticks or rockets that fly to the moon. Spring will come. We will all die. Some may see that as a dark sentiment, but I find it reassuring and hopeful. No matter what business we humans get about doing, barring some disasters that could take their toll on all species, nature will be here long after we have devolved or evolved. We can choose to see ourselves as a part of that larger picture, or we can mourn a superiority that simply doesn't exist. Cat does not know she is a cat. yawning a gaping grin, the maw of her lioness ancestors. Cat does not keep time. calling her to hunt, to pounce, to kill. She gulps her food with sniffs and meawps. but words glide past in a rush toward the climax. and the image is gone, the story's action rises. "The child's sealed mouth..." is lost. implying kidnap, enslavement, and trafficking. We, intrepid readers, missed it. taking the shortcut home to avoid the inconvenience. 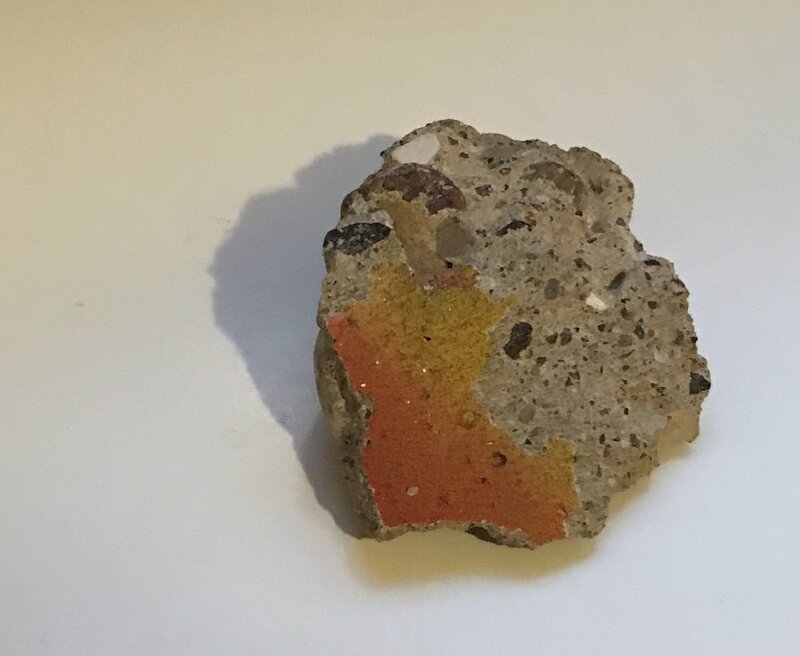 I’ve been walking around with a piece of the Berlin Wall in my purse today, a gift from my cousin Susan back in the ‘80s. It has lived in my kitchen cabinet in all of my homes. Though I wouldn’t have been able to tell you why at the time, a conversation with my students the other day got me musing. Beyond being an important piece of history, and beyond being a reminder of the relationship my cousin and I established in our early life, I think it has always been a touchstone for me, a reminder to keep an open mind, to allow people into my life, and to be cognizant of local and national policies that run antithetical to these practices. I considered the four students at the table. They’d each told me at various times what they planned for the future or had shown me who they were through their actions with others in class: E., the future immigration lawyer hiding behind a veil of machismo, smart remarks and clapback; J., the future optometrist or ER doctor (he’s not sure which) who has yet to find his voice; C., always willing to lend a hand, a strategist and philosopher if I’ve ever met one, whose anxiety compels him to shred paper, pens, pencils or any object he can tear; and J., E.’s long time friend and soccer mate and savior of assignments, the thinker behind E.’s action. The current policies that our government is implementing would mean I would never have had the opportunity to meet these students. It would have kept some of their families from our community, just as it will keep others like them from sharing their ideas, their bravery, their leadership and their insight with us. Current immigration policies have sent and will send some families packing, at times toward life-threatening situations and poverty. While rules guiding immigration status are a necessary part of governing, as is boarder patrol, knee-jerk reactions and overzealous policing do more harm and stifle progress. They will keep incredible hearts and minds like those of my students from becoming a part of our collective story, and that burden will be ours to bear. The proposed wall is ridiculous. As of January 2018, most of U.S. opposes it. Let’s spend $70 billion dollars on children. That kind of funding would help public schools in the U.S. truly expand our students’ worlds and would go a long way in facilitating global perspective and citizenship, as well as fostering empathy and collaboration beyond our boarders. There is not a child alive that does not deserve opportunities to expand their horizons, both by access to other countries through travel, and interaction with people who are allowed access to citizenship here. Germany tore down a wall after years of stifling the flow of people, innovations, and ideas between its separate halves, but here, in the U.S., the government is building walls every day with debilitating policies. They hope to build a physical one in the near future. Ridiculous!